Unbelievably, Christopher Nolan has never previously been to Cannes, and has this weekend popped his festival cherry not to promote one of his own blockbusting titles such as the Dark Knight trilogy, Inception or Dunkirk, but to celebrate the film that has most shaped his life and career: Stanley Kubrick’s 2001: A Space Odyssey. Fifty years young, 2001 last night screened as part of the Cannes Classics strand of the festival. It played in a restored print that has been supervised by Nolan, who is, of course, a champion of celluloid. 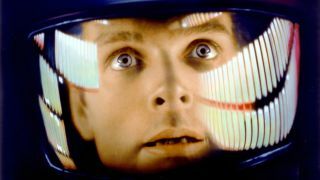 But here’s the thing: far from overseeing a digital scrub of the science-fiction masterpiece, Nolan has remained faithful to Kubrick’s vision and the technology available to him at the time – the 70mm print has been struck from the original negative and the six-track sound system remains in place. Christopher Nolan's restored version of 2001: A Space Odyssey will be released in UK cinemas on May 18, 2018. For more coverage from the Cannes Film Festival, read out review of Mads Mikkelsen's survival movie Artic.